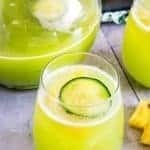 Pineapple Cucumber Rum Punch - Fresh Spring Punch for Brunch!Pineapple Cucumber Rum Punch - Fresh Spring Punch for Brunch! This bright and refreshing pineapple cucumber rum punch is perfect for Sunday brunch, Mother’s Day, Easter, or just quenching a thirst! In an ice cube mold, add a slice of pineapple and cucumber and fill with sparkling water. In a blender, combine pineapple, cucumber, and celery. Add water and blend until fully broken down. Let sit in fridge for 10 minutes to settle. Skim foam from top and add to pitcher or store in fridge up to 3 days. This makes approximately 4.5 cups of juice. To the juice, add limeade and rum. If it is too strong, dilute out with sparkling water to your liking. Serve with garnish ice cubes.